Elaine Hancock (Olney, United States) on 21 March 2018 in Plant & Nature. Another Nor'Easter moving up the coast. Le gel terrible le printemps n'est pas encor là quelle vue. Eh bien, le printemps semble venir a reculons chez toi, encore bien du gel ! Winter is still clinging on as we can see in your fine icicle laden image. Cette glace va faire du mal aux bourgeons. Oui tout à fait ! Une belle photo !! Beautiful - the droplets are like sparkling jewels! Spring is on hold, but in the meantime you are making the best of the wait. Nice shot. An excellent composition that fills the frame with these iced over branches!! Great choice for DoF as well. 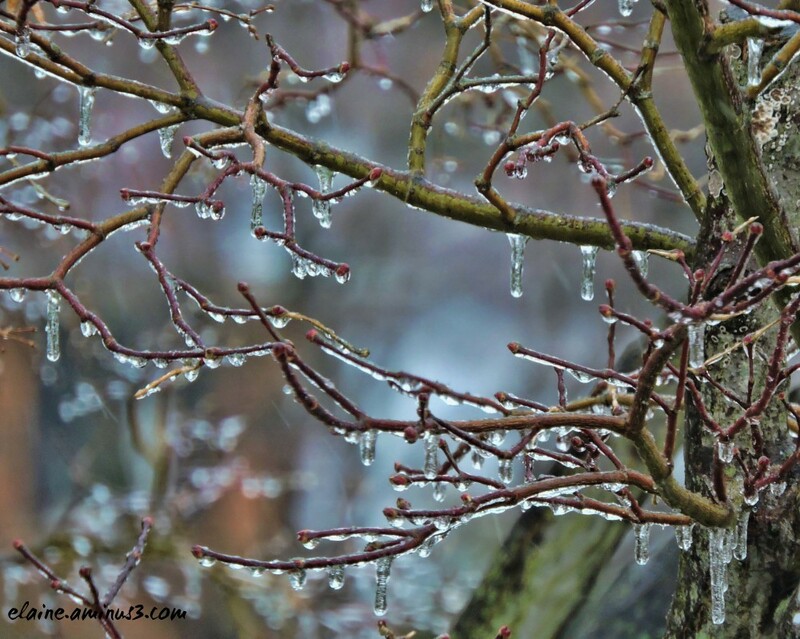 I icy branches is a reminder that nature can resort to winter overnight. A fine shot. Quiet, these are the last throes of winter. It snowed here yesterday too. Great photo of the frozen raindrops/dewdrops. The beauty of Mother Nature's artistry. Its been so cold, but we keep getting little glimpses of spring, but then it goes cold again. Certainly beautiful to look at ... but now it's time for a change!!! A terrible event that makes for a beautiful image. Hopefully, the trees and flowers will make it through and the birds, too. Oh my! Wonderful capture of spring's capricious nature. No spring yet but the icicles look beautiful on the branches and I like the shallow dof effect.